Notes: Other than saying I am not going to make any Dark Knight comments, I am not going to make any Dark Knight comments. Instead I want to talk about the name. Because Depth Charge was only the second Maximal whose name did not instantly tell you his transformation. Oh, it’s pretty easy to figure out that he’s a water-based mammal, but nonetheless, it is not automatic. A nice change I think. 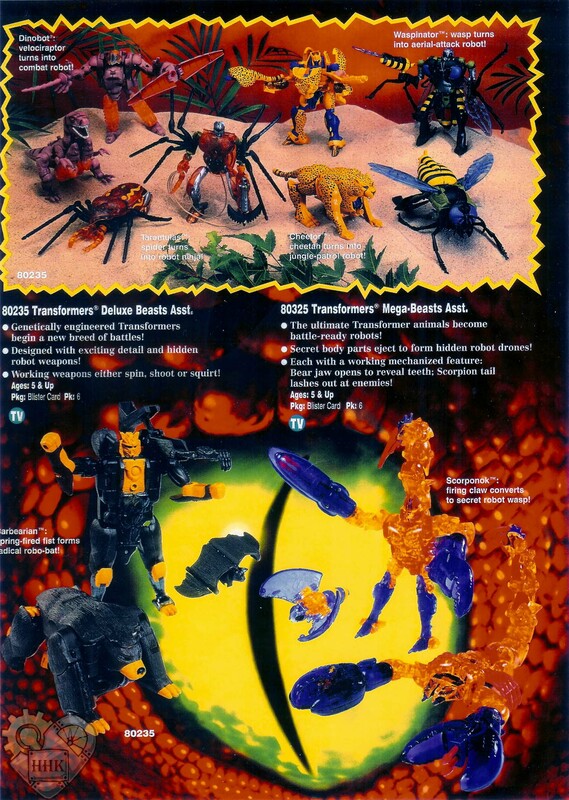 Notes: While Cheetor got terribly serious and became a bit of a spoilsport in Beast Machines, it was nonetheless great to watch his evolution over 78 episodes in Beast Wars and Beast Machines. So many good toy choices too, but in the end I went with the much missed (by me at least) Titanium version for the big reason that it was the both the only Beast Machines release in this format and the first official release of swords. And no Night Slash Cheetor doesn’t count! Notes: I always like the concept of blended animals that came out of the Fuzor line and was happy that at least two of them appeared on the show. And what a loveable character Silverbolt was, making his evolution in Beast Machines (first as Jetstorm and then his brooding return to the Maximal fold) that much striking. I really wanted to showcase the Beast Machines toy, but even with the colour corrected Takara release, the sizing issues alone (a basic toy when Nightscream and Jetstorm both warrant ultras?) prevent me. So “classic” Silverbolt it is. Notes: Quickstrike was one of two fuzors used by Mainframe and they really had some fun with playing up a western theme with him. Not the most effective Predacon, you gotta wonder what he would have been like had his protoform been able to emerge as a Maximal. Notes: Air Hammer almost makes you wonder why a hammerhead shark and a hawk evolution never came about. Everything from the choice of animals to paint applications seems so natural and smooth. It’s enough to make you wish she had made it onto the silver screen. Notes: Before Transformers: Animated retroduced a neophyte Optimus Prime, Beast Wars brought us Optimus Primal, a commander who just happened to be in the wrong place at the wrong time, taking an undisciplined crew into a war and coming out a leader. Though his metamorphosis into a Transformers shaman was not the transformation fans had hoped for, the delayed release of the Supreme toy under the Robots in Disguise banner was most welcome. The boss monkey fits in perfectly in scale with Takara’s Masterpiece line, as well as Supreme Cheetor, Ultra Nightscream and Mega Rattrap. Notes: Where Dinobot lived for honour, Scorponok died for loyalty. Like Soundwave to the original Megatron, Scorponok did not question his leader’s orders or schemes, and was seemingly happy in his status as loyal lieutenant. It made him the only one out of the original Nemesis crew that would remain so true, which made it all the more ironic that he would meet his end without so much of a final salute. Notes: It seems appropriate, given that the Decepticon cassette brothers were clones of one another, that Eject would be a simple repaint of Rewind. Originally issued with Ramhorn, Eject makes a cameo in the animated movie to defend the communications tower from the Decepticon cassettes. It’s nice to see old friends once again. Notes: Before Polar Claw was, Grizzly-One was. You see Hasbro had originally planned to solicit Polar Claw in shades of brown and yellow. While I’ve no information as to what pre-empted the change, hats off to Takara for bringing the original beauty to life as an exclusive for the second (and last!) Botcon Japan, to say nothing of including the similarly painted Survive in Beast Wars Neo. -Notable Toy: Deluxe (Takara, 1996)Notes: If Terrorsaur took his place as his Megatron’s Starscream, his plans were not quite so ambition, his schemes a little less grand. Makes you wonder if he had survived a bit longer, if things would have been different. Sadly, his passing with Scorponok was barely noted, and his toy never properly realized. Best one can do is Takara’s version. But you just hold out hope for a slightly bigger and slightly redder Terrorsaur. One with a bit more ambition.